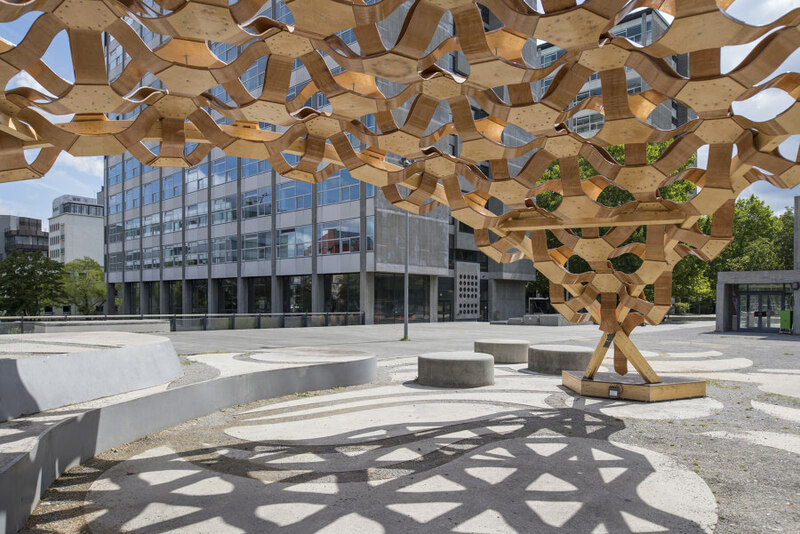 On 15th August there was an official opening of the first experimental pavilion, realized by the department of Biobased Materials and Material Cycles in Architecture (BioMat), located at the Institute of Building Structures and Structural Design (ITKE) in the Faculty of Architecture and Urban Planning, University of Stuttgart. 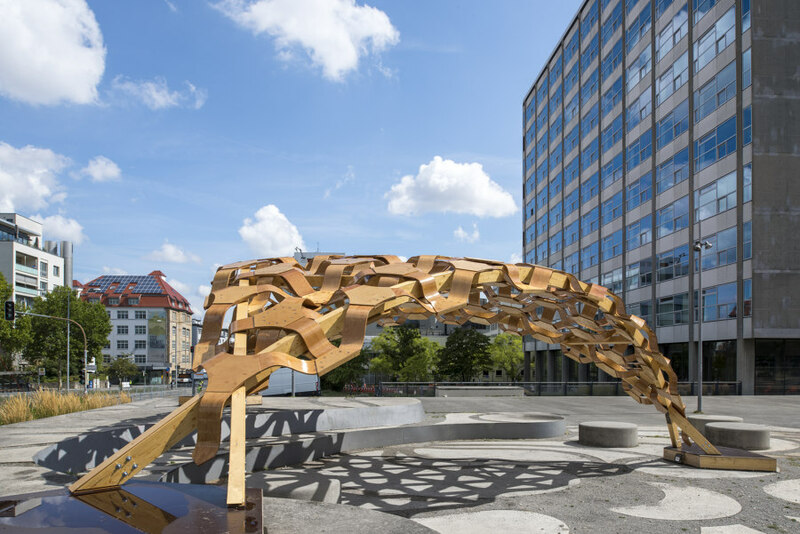 The pavilion, located at University Campus in city centre, Keplerstrasse 11, is a double-curved, parametrically designed segmental shell of light, single-curved wood and biocomposite elements, which are supported by three curved crossed wooden beams. 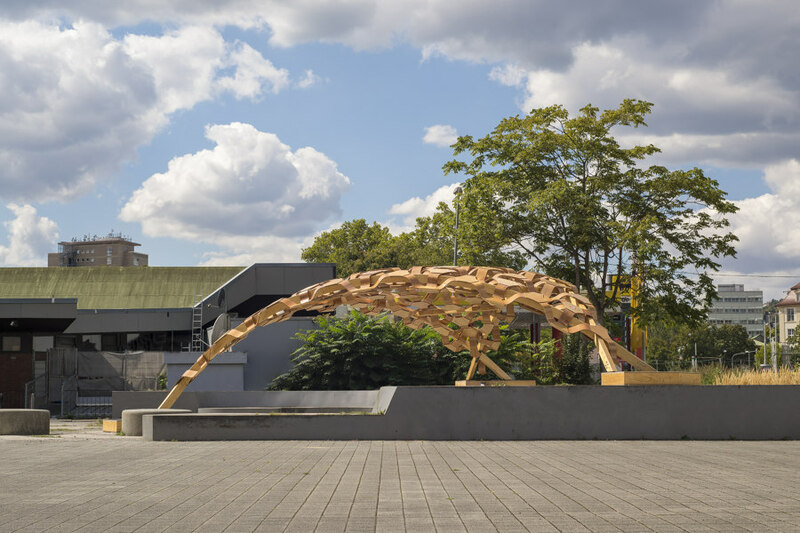 The BioMat Research Pavilion demonstrates the architectural and structural potential of novel building materials made from agricultural production wastes. 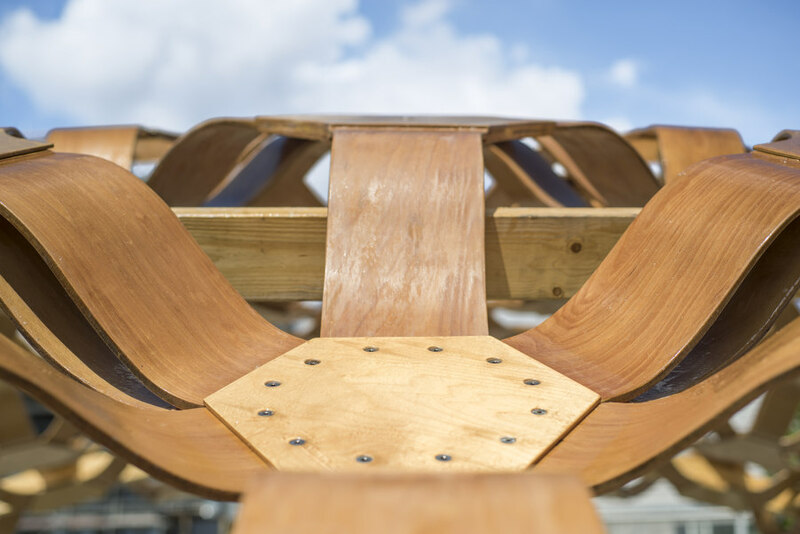 BioMat department focuses on a mission of examining different sustainability aspects in architecture. 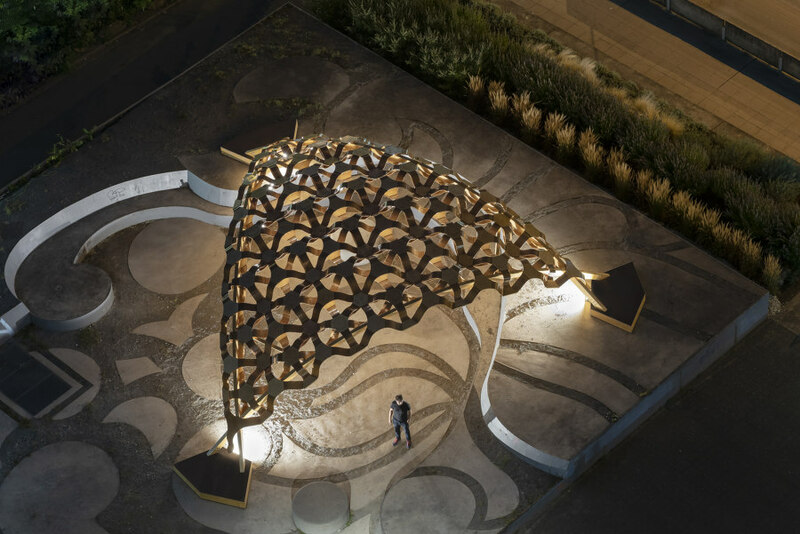 This built work is the result of 10 months of intensive work, following many years of work in the field of applications of bio-based materials and diverse approaches towards future-oriented sustainable architecture. 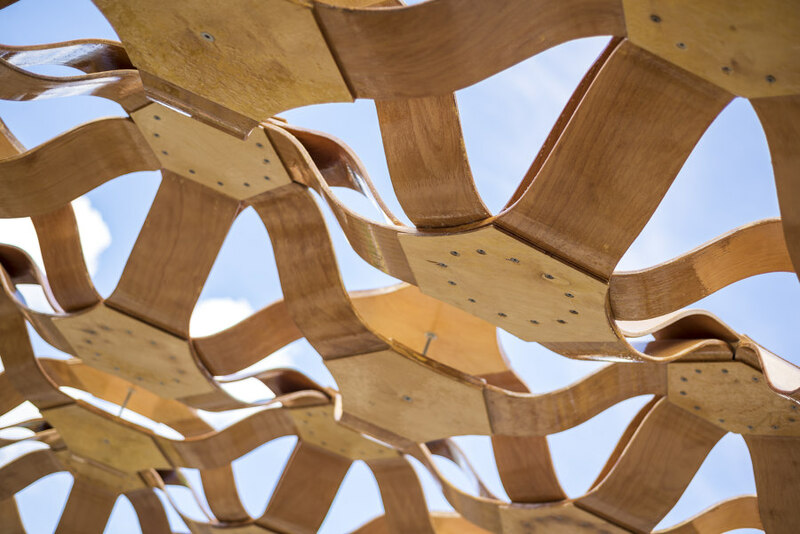 In the course of research work prior to the construction of the pavilion, special wooden-based biocomposite plates were developed. The core of the plate is a flexible board made from natural fibres mixed with bioplastic, manufactured by an extrusion process. The natural fibres, such as straw, are waste coming from agricultural production, which find its second life as material for architectural use. This material used as core board was developed previously by the head of BioMat, prof. Hanaa Dahy. One of the main advantages of this board in comparison to, for example, MDF, is exceptional elasticity which allows for forming even extremely double-curved surfaces, without heat or water treatment. The CNC cut fibreboard cores are later laminated from both sides with pre-cut 3D veneer sheets – a kind of veneer which can be bend in 2 directions at once. The processes of lamination and forming happen in a mould inside a vacuum press bag. Lamination not only allows to form a flexible flat core board into a stiff 3d bent element, but also allows to create a composite panel with mechanical properties higher than core material itself. For example, during bending test specimens reached Elastic Modulus of over 5,5 GP which is equal to MDF. Simultaneously, another variation of a similar wooden composite plate was developed, in which a flexible wooden board with single direction fibres is used as a core. 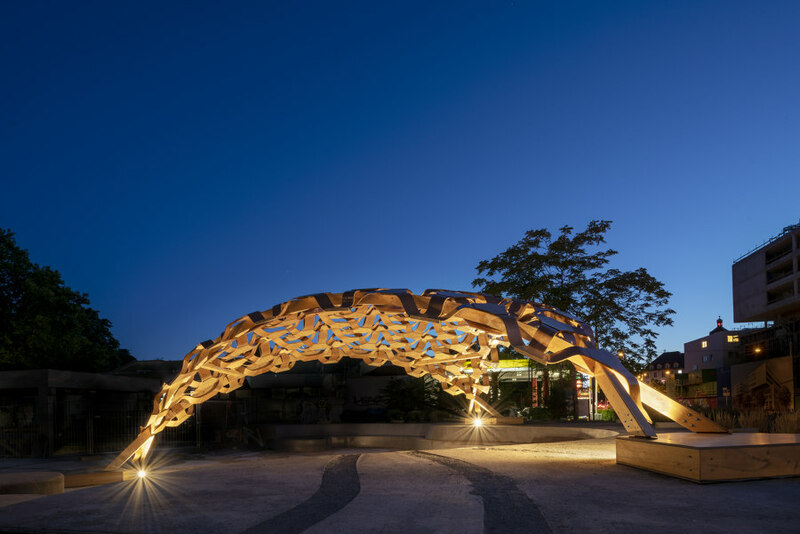 This variation achieved identical mechanical properties as the first one and finally, due to logistic reasons, was used in this pavilion. Each 3 manufactured elements were glued together into a 3-leg components. 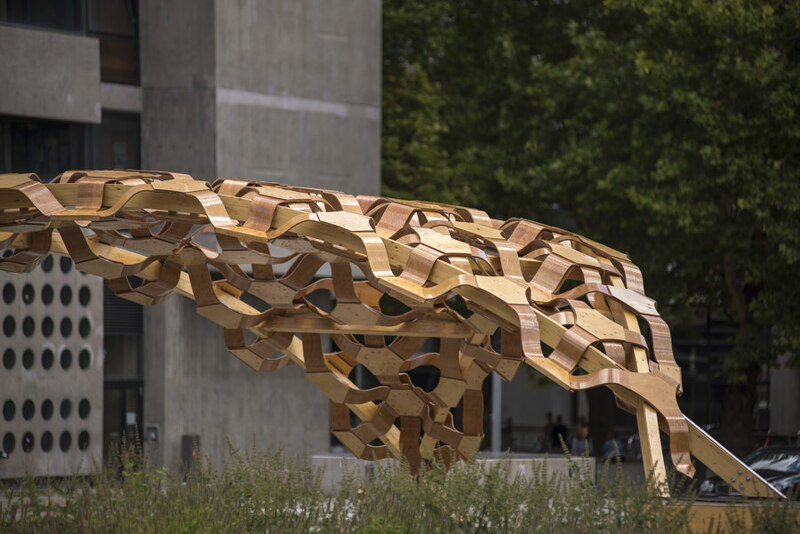 According to physical tests conducted by us, PVA D4 glue provided not only the strongest connection between elements (as strong as the fibre board itself), but also allowed for comfortable preassembly of components off-site. 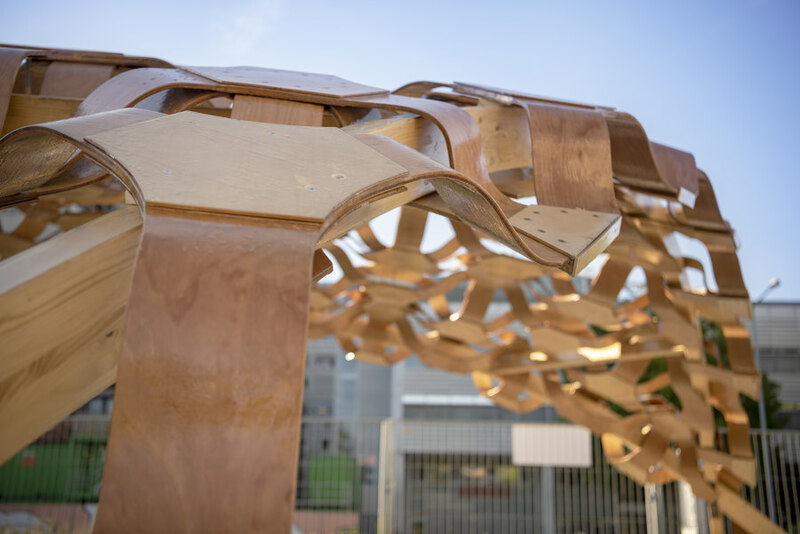 Later, all 121 components were connected together on-site into 4 fragments, using screws, and pulled on top of the crossed wooden beams, like a piece of fabric, where the final connections were realized. Such approach allows for elements to be separated later and reused to form various other designs and constellations. Foundations of the beams are located at different height levels, allowing the structure form for visual and functional adaption to the local landscape. 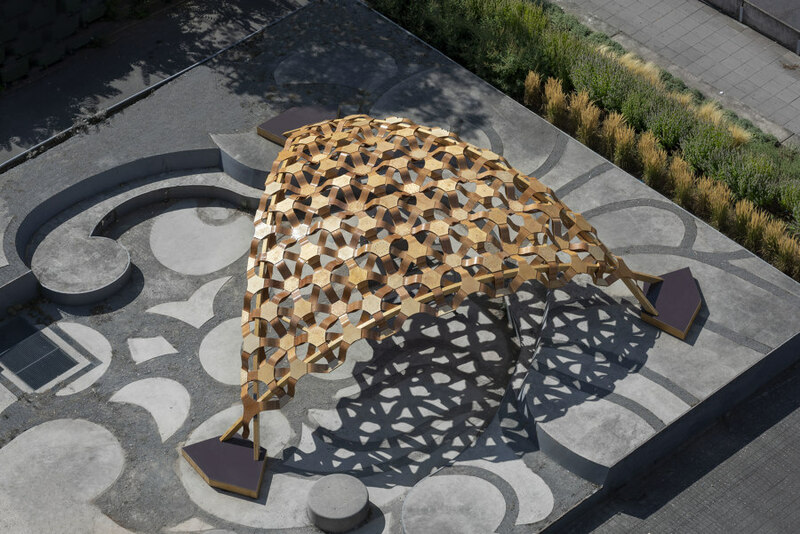 Within the structure, components interweave with each other, creating a segmented shell which resembles a 3D fabric in which the curved elements are connected to common nodes in all directions in space. 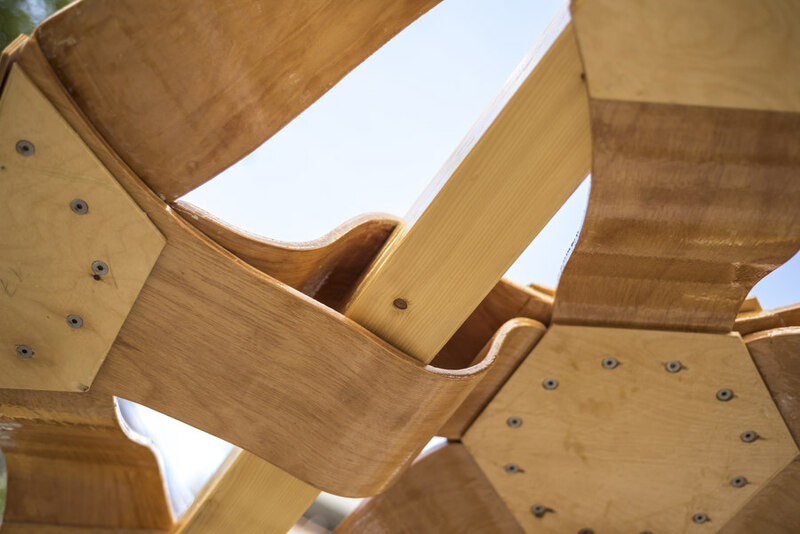 The pavilion can withstand harsh weather conditions as all components were coated with protective system used in wood industry. 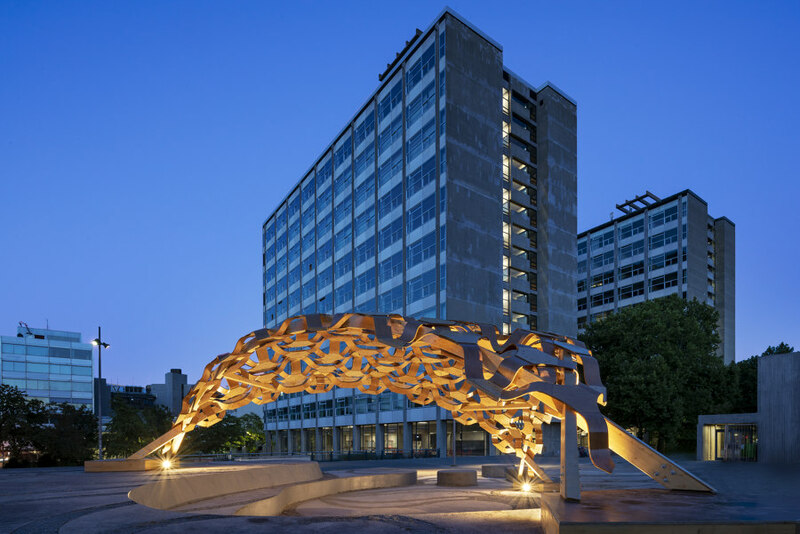 The BioMat Research Pavilion 2017-18 covers an area of about 55m2 and an internal volume of approximately 130m3 with a span of 9.5m and a height of 3,6m. The work was the direct result of cooperation between experienced architects, around 40 architecture students over two semesters, with support from the University of Stuttgart, the German Agency for Renewable Resources (FNR) in the Ministry of Food and Agriculture (BMEL), the Baden-Württemberg Foundation, Fraunhofer-Institut für Holzforschung (Fraunhofer WKI), and industrial funding from Mathias Stange ETS and profine GmbH in the framework of the Research Project (BioProfile), International and local collaboration has taken place, among others with the Technical University Eindhoven in the Netherlands (TU/e) - Department of Built Environment - Prof. Patrick Teuffel and various institutes of the University of Stuttgart, including the Institute of Construction and Structural Design (KE, Faculty 02: Civil and Environmental Engineering) - Prof. Urlike Kuhlmann and the Institute of Engineering Geodesy (IIGS, Faculty 06: Aerospace Engineering and Geodesy) - Prof. Volker Schwieger.